If I was aware there was an undercover cop in my classroom, that would definitely change the dynamic. I teach government, so I get a lot of legal questions and a lot of my students are vocal about how anti-police they are. That would be really strange: "Let's ixnay on the cop-talketh right now." But I would probably have the guts to give a cop an F. Although I don't give that many Fs. And if a cop was trying to get me in trouble, I'd be like, "Hey, hey, hey! No entrapment!" The stories I've heard about cops undercover in schools haven't been about drugs necessarily. I think they were about guns. But I think the '90s was the heyday for that. Drugs can be a big problem, though. Especially in some of the districts an hour or two away from here that have kind of become meth capitols. Alcohol use is a problem, but that's happening more outside of school. I don't know how true that whole vodka-soaked tampon idea is. A couple local high schools have had some major violence. A student was stabbed at a school south of here four or five months ago. But I don't know if the solution to that is in the school or if the prevention is police-related—it's a larger social problem. If a kid who looked like Channing Tatum showed up at my school, would I suspect anything? I mean, I know high school athletes' bodies are a lot more developed. I do have some big boys in my class—actually, I have one student who even reminds me of Channing Tatum. He's about 6'1" or 6'2" and he's pretty built. Definitely towers over me—I'm 5'8". But some of the kids are just so overdeveloped nowadays, it's hard to tell? They're definitely maturing faster. I don't know if I'd do anything? That's just something I haven't been trained on. I mean, if I knew there were students who are definitely undercover, I guess I might just ask? Or if I start poking around, but their records and all of that are probably falsified anyway. Did the principal even know in the movie? I've heard of real life stories where only the principal and one or two other administrators were aware that cops were there undercover. I don't even think there's a policy that's been written down about it—I don't think it exists in any district handbook. High school is definitely very different than the way it was when I was a kid. I went to a stratified school similar to what they first depict in the movie. Even though my school was 90 percent Latino, there were the jocks, there were the nerds, the kids who were on the fringes. Socially, there are still people who are marginalized, whether it's by association of who you hang out with or what items you possess. Rumors travel fast in high school. At my school, there's not much that's said or done without it spreading quickly. If it's not spread on the campus, it's spread on Facebook. I think it's hard for adults to keep up with the quick pace of information transfer kids expect. Even when I give a quiz, they want the results instantaneously. Instant gratification—there is no waiting. They're dying right now because they're waiting to hear back from their colleges. They're been given a date and time and they're literally counting down to when it's going to happen. In my school, there's a big push to develop character. Something as simple as one of our teachers actually teaching a lesson on how to construct an appropriately written email to a teacher, or anybody who's not in your friend list: to capitalize words and not say things like "Hey" or "LOL." I've been at my school for six years. The hierarchy, the jocks, all that stuff is here, but it's not as bad as the general stereotypes that we have about high school students. Has there really been a shift in how teenagers are like they say in 21 Jump Street? My school's pretty awesome, but we do have the kids who are unmotivated and don't care. That definitely still exists. But in the movie, the kids are very conscious about the environment and driving low emission cars—that stuff was an accurate portrayal of 21st century kids who really are knowledgeable about the world. That's one of the biggest changes: kids have become a lot more consumer-oriented. Whether it's conscious or subconscious, it's a huge part of their lives. Two years ago I went to D.C. with a bunch of students for an academic trip and as we were driving from the airport, the other teachers and I were like, "We didn't realize Virginia was so beautiful! Look at the architecture!" At the same time, in the background I'm hearing, "Look—Starbucks! KFC!" All the brands they've been bombarded with, that's what was important. And the better phone you have, the better the implication of your family's wealth. That's very present in my school. I did like that the movie was set in a diverse school. The one student who gets beat up by Channing Tatum is not only African-American but gay, and that's okay—he's part of the cool crowd. I think that level of acceptance and tolerance is there, but it's all about perception. There's that moment in Jump Street when Ice Cube says the only reason they're investigating the drug case is because a white kid died. There's a certain level of truth to that. I don't know how much attention would have been drawn to it otherwise unless it was a really extreme case. Suburbs tend to be looked at as havens of virtue. But the districts now that have the drug problems used to be suburbs of white flight. But that stuff is probably happening there just as much, if not more. I liked when Channing Tatum went into his AP science class and the kids were all excited and wearing sweaters about their favorite molecules. I teach and AP class and there is definitely a level of enthusiasm about the content. It was slightly exaggerated, but my kids do come in with a lot of passion for what they're learning. There's a large truth to that. I wouldn't call my kids "nerds." They're highly motivated, driven, and they definitely want to be successful. They've figured out that there's a game to play and the game includes going to college, so whatever they have to do to get there gets done. 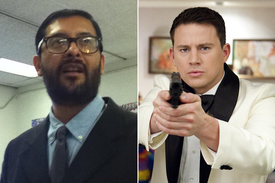 The teacher who was hot for Channing Tatum was super hilarious. I think switching the gender from a male teacher to a female teacher and a male student made it easier to swallow for a lot of people. If it was reversed, it'd be more problematic. I imagine they were trying to be sensitive with how that was portrayed. School distracts go through training to prevent that and there are extensive rules about conduct in general, visibility, where you are in a room. It's definitely out there. As for the fact that one of the villains is a fellow teacher, I've got to be honest that I didn't see that coming. And they said it was because of the size of their teacher salary—that you've got to do what you've got to do to make ends meet. I can't tell if that's a stab at teachers or a critique on how undervalued and underpaid teachers are that they're being driven to do these criminal acts. I guess theoretically a teacher would be capable of something like that. You push people far enough and they're willing and able to do anything. One thing I thought was wrong in 21 Jump Street—and this is a minor pet peeve—but I really hate the unrealistic amount of free time between class periods that movies show high school kids having. The passing period in my school is five minutes. No one has time to have these long-winded conversations about the plot in between classes—they barely have enough time to get from one place to another. Put these conversations during lunch or another period when they'll have an extended amount of time. But a seven-minute dialogue between physics and math? Not going to happen. I overheard some students talking about 21 Jump Street but a lot of them didn't know what it was. I don't think any of them realized that it was the remake to a TV show. One of my students was like, "Why was Johnny Depp in a random cameo?" "Well, actually it wasn't random—it was on purpose." They hadn't seen the show so they didn't know. I explained it to them. I actually teach a popular culture class and I tell them that remakes are because of the state of the economy. It makes sense: why brand from scratch when you can rebrand something that's already been done? Want more Expert Opinions? Check out our free iPad weekly.